The Southern California Branch of the American Society for Microbiology offers many opportunities for undergraduate and graduate microbiology students. Here, learn more about presentation opportunities, science fairs, upcoming events, and other opportunities especially for SCASM students. The SCASM Student Activities and Outreach Committee would like to thank all the students who attended the SCASM 82nd Annual Meeting in La Jolla, CA. We hope that it was time well spent with your peers while acquiring new knowledge from our speakers about microbiology, including professional and educational development. Our ASM guest speakers in attendance at the Saturday sessions, Drs. Stefano Bertuzzi (Executive Director CEO), Robin Patel (President-elect & Director of the Infectious Disease Laboratory at Mayo Clinic) and Shilpa Gadwal (Career Specialist) were all very impressed by the enthusiasm and motivation expressed by students wanting to pursue careers in the natural sciences. People raved about the high caliber of research and how exceptional the students were that participated in the collegiate poster session. 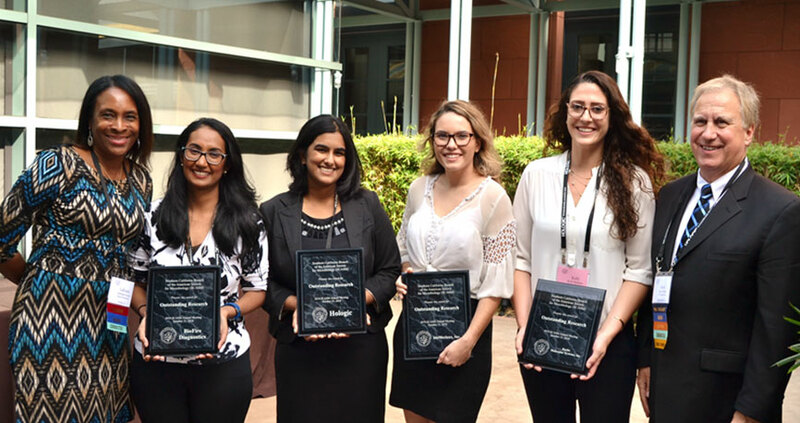 Congratulations to the four winners of the SCASM 82nd Annual Meeting Collegiate Poster Session. The winners of the poster competition will each receive a travel grant to attend and present their posters at ASM Microbe 2019, June 20-24 in San Francisco. For more information about ASM Microbe use the following link, https://www.asm.org/. Thank you to all the students who participated in the poster session, and we hope to see you again in 2019. SCASM is pleased to continue the tradition of providing a forum to support student research, promote learning and student engagement. We value student involvement, and as an organization we are working to make the student experience more meaningful. See below a list of all the schools represented at this year’s meeting.